The current term at the Supreme Court has been anything but ordinary. With two argued cases already ruled moot the justices are down to 61 argued cases for possible signed decisions. This would tie last term for the fewest signed decisions in the modern Court era. Not only are the cases few and far between, but the Court’s pace in deciding cases is exceedingly slow. As the justices have completed 32 signed decisions so far with 29 still pending, they have to write opinions in almost half of the argued cases with just over 10% of the term remaining. With so few total cases, one might expect the same group of elite Supreme Court attorneys that have become a mainstay of Supreme Court practice over the past decade to continue monopolizing the balance of the Court’s merits docket. This has primarily proven true this term, although with some exceptions. 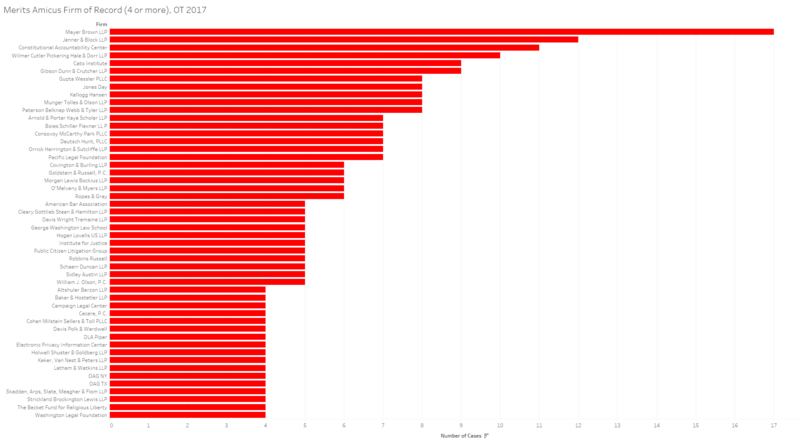 This post looks at the attorneys that argued cases before the Court this year and then at the counsel of record on merits and amicus briefs. 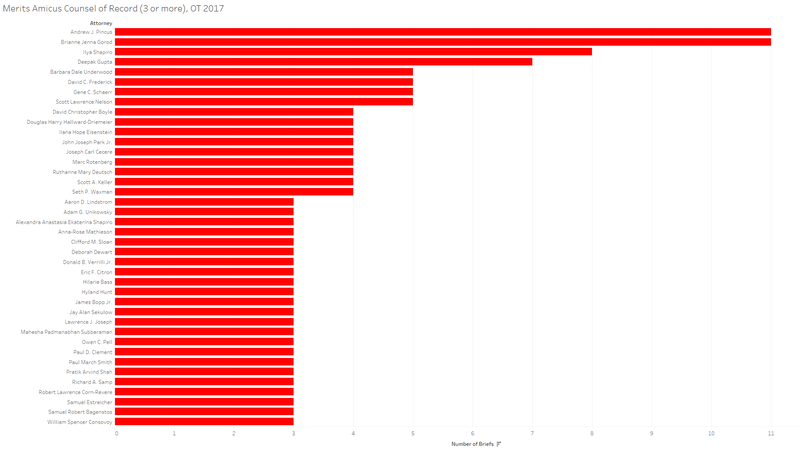 Although mainly well-known Supreme Court repeat players, the most frequent arguing attorneys this term also included some attorneys that have had an increasing hand in Supreme Court cases in recent terms. Paul Clement was the leading oral advocate before the Court this term with six appearances covering almost 10% of the argued cases this term. His count surpasses even those of OSG (Office of the Solicitor General) attorneys Noel Francisco, Jeffrey Wall, and Michael Dreeben. Ohio’s Solicitor General, Eric Murphy, argued four cases. He did not argue in the Supreme Court last term. Along with OSG attorneys and Supreme Court regulars Jeffrey Fisher and Neal Katyal, Stris & Maher’s Daniel Geyer and Texas’ Solicitor General Scott Keller had three arguments apiece. Geyser’s presence is especially notable as this highlights the increasing presence of this boutique appellate firm before the Court (Stris & Maher is not new to the Court though as named partner Peter Stris mainly handled the firm’s Supreme Court litigation in the past). Focusing on counsel of record in cases according to Supreme Court dockets, the next figure shows the repeat player counsel of record for the term with OSG attorneys removed. Since these are gleaned from Supreme Court dockets they do not necessarily match the arguing attorneys in every case. 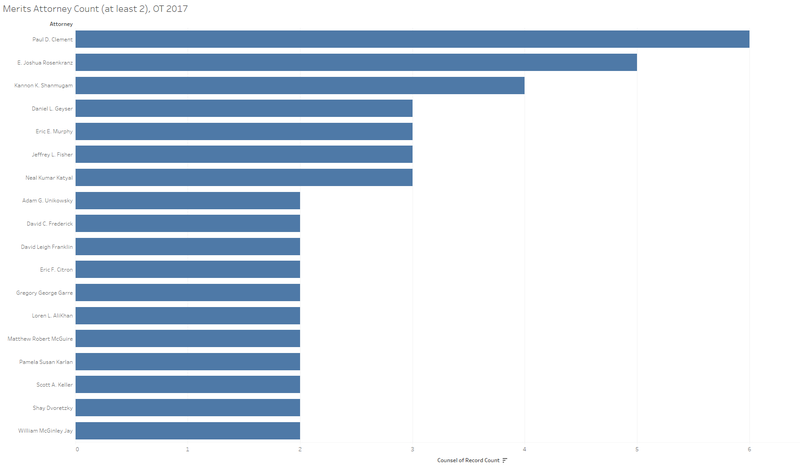 Several, but not all attorneys, were top oral advocates this term including the most frequent counsel of record Paul Clement. Even though he argued two cases, Orrick’s Josh Rosenkranz was counsel of record in five cases. Rosenkranz is followed by William & Connolly’s Kannon Shanmugam who argued three cases this term. Many of the other attorneys in this figure are well-known to the Court, yet several of the state government attorneys including Loren AliKhan for D.C., David Franklin for Illinois, and Matthew McGuire for Virginia each argued their first cases before the Court this term. Another vantage of attorney participation is an examination compared to last term. 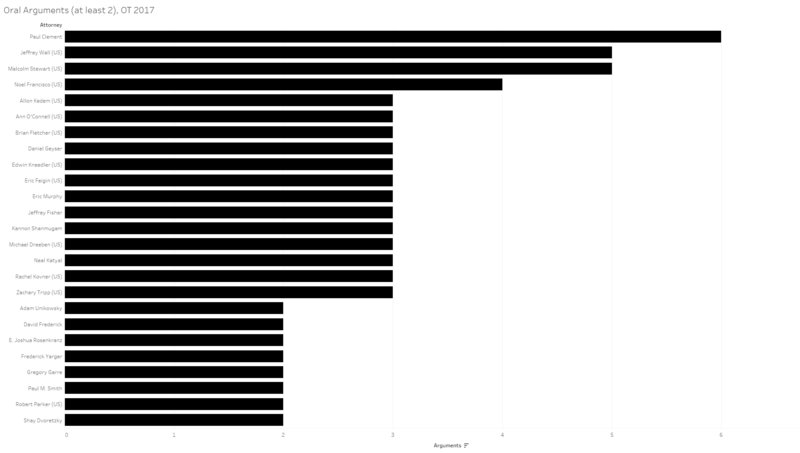 The following figure looks at the involvement of the most active attorneys of record this term compared to last. Daniel Geyer had the largest jump this year increasing 200% as he moved from one case as counsel of record last term to three this term. Shanmugam and Clement both doubled their counts from last term with six and four cases as counsel of record respectively. Rosenkranz went from three cases last term to five this term. On the other end of the spectrum, Katyal moved from six cases last term to three this term and Fisher went from four cases last term to three this term. 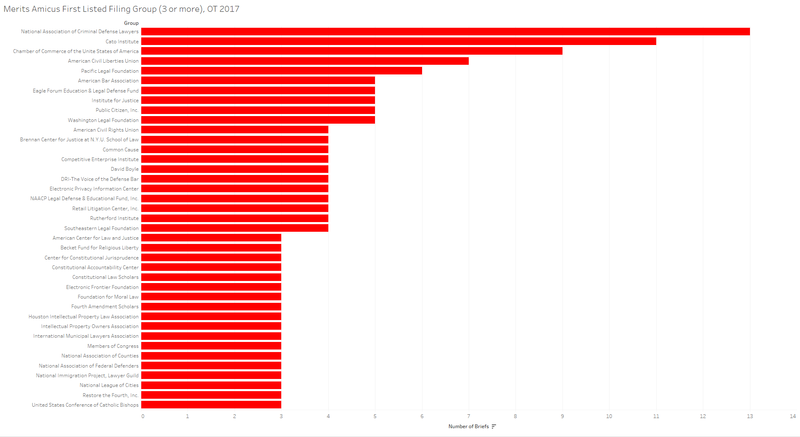 The firm of record on the merits counts mostly parallel those of attorneys of record, yet several firms are notable because several of their attorneys tried cases before the justices this term. The numbers for Kirkland and Ellis are driven by Paul Clement. Orrick’s numbers are generally driven by Josh Rosenkranz although several other Orrick attorneys including Bob Loeb and Kelsi Corkrin also argued cases this term. Multiple attorneys were counsel of record on the briefs for several other Supreme Court powerhouses including Jenner & Block, Jones Day, Gibson Dunn, and Goldstein & Russell. Along with big and small law firms several states participated before the court in multiple cases this term as did interest groups such as the ACLU and the Pacific Legal Foundation. Several of these top and groups firms also saw jumps in their participation from the 2016 term. Jones Day and Williams & Connolly made the largest jumps this term moving from two cases last term to four this term. 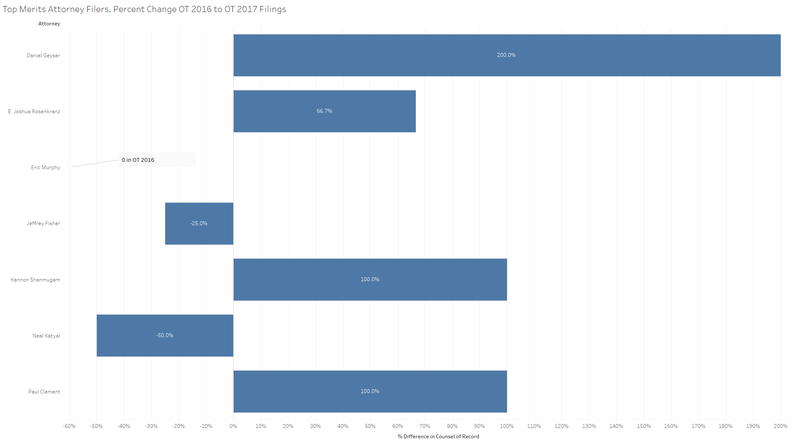 With Paul Clement’s increased participation this term Kirkland & Ellis also saw a jump in cases as did Orrick and Stanford’s Supreme Court Litigation Clinic. 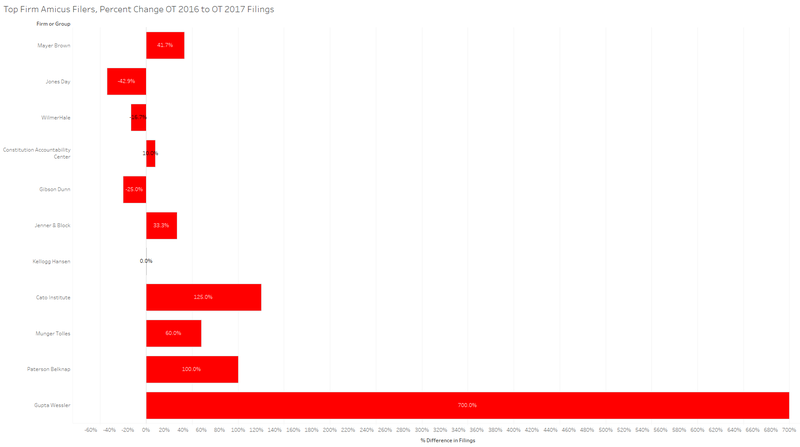 Merits participation only tells part of the story though as few trends in the Supreme Court are more significant than the rise of amicus filings. The sheer volume of such briefs filed each term eats up much of the Court’s resources (a co-author of mine, Aaron-Andrew Bruhl, and I proposed using plagiarism software as a partial solution to this problem in a recent paper). This shift in resources is possible with the Court’s declining caseload as the Court is on pace to hear only about 40% of the number of cases this term that it heard in the early 1980’s. While Ilya Shapiro led attorney filings in the earlier post, the two attorneys with the most filings this term were Mayer Brown’s Andrew Pincus and the Constitutional Accountability Center’s Brianne Gorod. Shapiro ended the term with the third most amicus briefs followed by Gupta Wessler’s named partner Deepak Gupta. Similar to Daniel Geyser from Stris & Maher, Gupta’s increasing presence in the Supreme Court is particularly notable because of the small size and boutique nature of the firm. Several of these top filers increased their amicus counts this term from last but none as much as Deepak Gupta. Gupta jumped from one amicus filing last term to seven this term. Barbara Underwood on behalf of New York State moved from zero amicus filings last term to five this term. 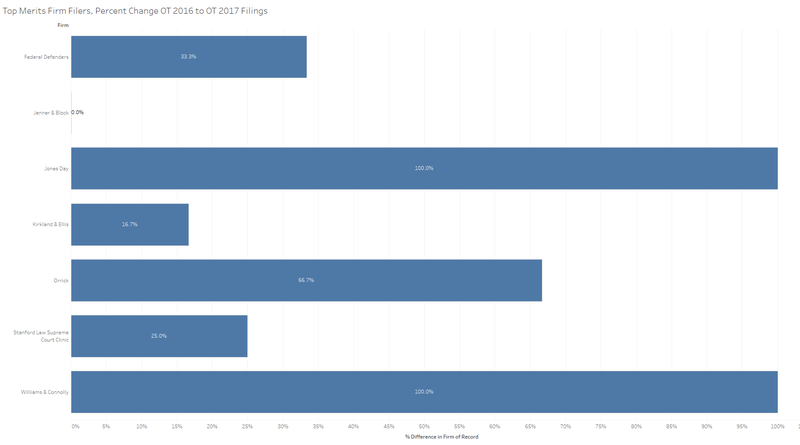 The other attorneys on this list had more moderate but nonetheless noteworthy increases including Shapiro who went from four briefs last term to eight this term and Pincus who went from six last term to 11 this term. Similar to the firms of record on the merit, some of the top amicus firms on the merits are driven by one attorney’s participation while other firms have more distributed resources. Many of the briefs by WilmerHale were authored by lead appellate attorney Seth Waxman, for instance, although several other of their attorneys were also counsel of record on amicus briefs including Alan Schoenfeld, Jason Hirsch, Mark Fleming, John Walsh, and Philip Anker. Jenner & Block had a mix of filers as well including Jessica Ring Amunson, Adam Unikowsky, Joshua Segal, Matthew Hellman, Lindsay Harrison, ex-Acting SG Ian Gershengorn, and Sam Hirsch. Similarly, Gibson Dunn’s amicus counsel included Douglas Cox, David Debold, Mark Perry, Ted Olson, Matthew McGill, and Theodore Boutrous. This mix of participation at the firm level shows both firms’ and clients’ willingness to use a diverse set of attorneys in such instances. Several of these firms with top participation levels saw increases from the 2016 term although others saw dips. Like attorneys of record on amicus briefs, the biggest jump for firm was Deepak Gupta’s firm Gupta Wessler. Other large jumps include that of the Cato Institute which moved from four briefs last term to nine this term, and Patterson Belknap which moved from four briefs last term to eight this term. 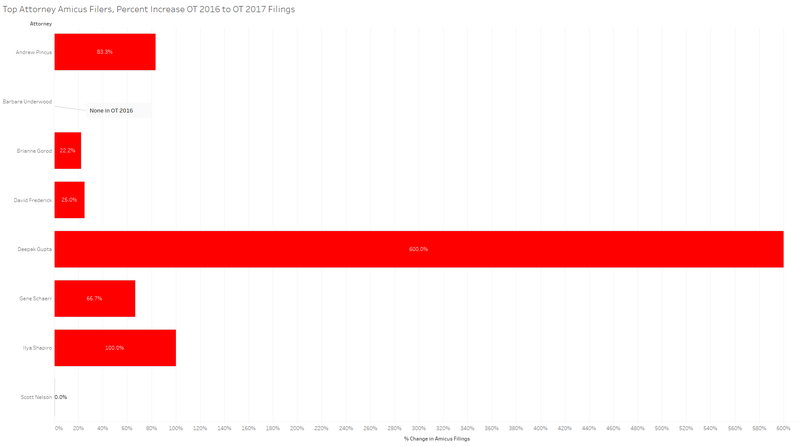 After a huge term in 2016 though, Jones Day saw a decline in amicus filings this term going from 14 in 2016 to eight in 2017. Although sometimes the groups sponsoring amicus briefs have their own in-house counsel author their briefs, in many instances outside counsel are used for brief authorship. 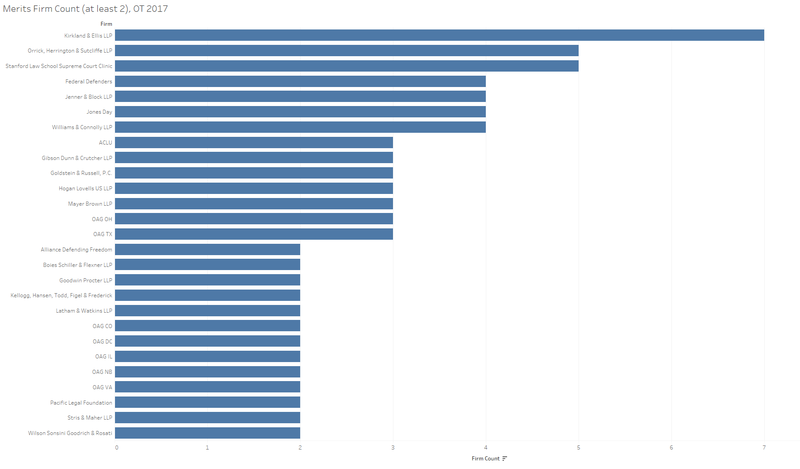 The following figure looks at the first named group sponsoring at least three amicus briefs on the merits this term. One of the most prolific amicus filers over recent years, the National Association of Criminal Defense Lawyers tops the list of groups with 13 briefs as the first named group. The Cato Institute and the Chamber of Commerce, two top filers for the past several years filed the second and third most amicus briefs with the ACLU and Pacific Legal rounding out the top five. The ACLU and Pacific Legal also participated in three and two cases on the merits respectively. Some of these briefs have a significant impact on the Court’s opinions. The majority and separate opinions in Jesner v. Arab Bank for instances cited amicus briefs a total of 20 times. Even in cases where the briefs are not cited though, they may still affect the Court’s final products. Merits attorneys, through effective arguments and briefs, also have the capacity to sway the justices’ decisions and their arguments are at very least reflected in the justices’ decisions. Justice Kagan’s majority opinion in Sessions v. Dimaya for instance cited oral arguments in four occasions. While it is not possible to know whether oral arguments and briefs shift the justices’ views or just confirm their suppositions, they perform necessary roles in the genesis of the Court’s jurisprudence. This term we saw both veteran attorneys and rising stars take lead roles before the justices. These attorneys came from small and large sized firms with several boutique firms taking on an oversized presence. One thing that will be interesting to track in terms to come is whether such small, focused appellate practices begin to take larger roles before the Court. It will also be intriguing to see how big firms attempt to maintain their presence in the Court with these additional attorneys vying for the biggest cases. Next Post A Seismic Shift?